Your mouth is vulnerable to infection in all corners of its space. There are many causes of dental infections that can take on different forms. The lips, tongue, palate, cheeks, gums (periodontal infection), and areas within and below teeth (endodontic infection) can become infected in the mouth and lead to serious, potentially life-threatening complications when left untreated. Your chances of encountering a dental infection or abscess are higher with poorly maintained teeth. Most infections are created when the enamel layer of teeth becomes cracked or chipped allowing bacteria to enter the tooth’s pulp (core containing nerves, tissues, and blood vessels) and travel to the surrounding bone or tissue creating a dental abscess. 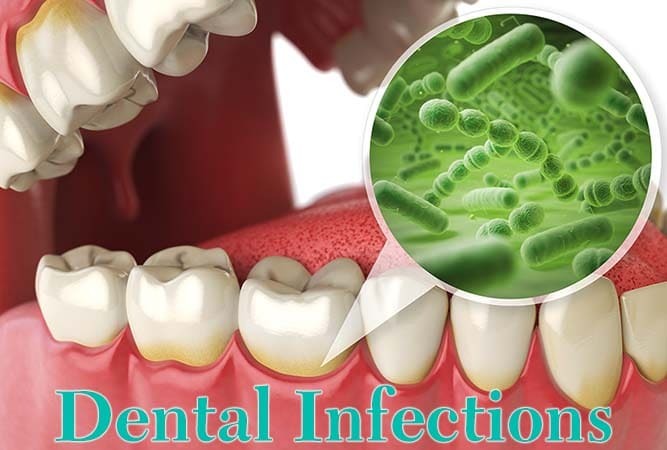 To treat your dental infection today, visit the Oxnard dentist with over 45 years of experience in Emergency Dentistry – Carson & Carson, DDS. We offer 24 hour availability to treat non life-threatening dental emergencies in Oxnard, California. In some extreme cases, the infection swelling can become so severe that it threatens the patient’s airway and can create serious respiratory issues. If you have both swelling and fever, or trouble breathing or swallowing you should seek immediate medical help because you may have a serious infection. Many infections in the mouth are caused by a buildup of plaque, so good oral hygiene habits are key in preventing these infections and maintaining a healthy mouth. Brushing & flossing your teeth twice a day and visiting the dentist at least twice a year are habits that can keep your natural smile looking pearly white & healthy. Flossing everyday keeps the mouth clean by killing bacteria that could otherwise penetrate into tooth enamel and create cavities. Perform Root Canal on tooth. Your dentist will drill into the tooth removing infected pulp and then draining the abscess. Afterward, the tooth is filled and sealed, and a crown is typically placed over the remaining tooth to protect it. Incise & Drain Abscess. Some abscesses are close enough to the surface of the gums that they can be accessed by simple incision (cutting) into the gums. These abscesses are cut into, drained, and then washed with a saline solution to prevent further infection. Pull Affected Tooth. A tooth may have be pulled to allow proper access to an abscess below it. The affected tooth would be extracted, abscess drained, and saline solution used to prevent further infection in the cleft left by the abscess. These procedures can be done under the peaceful sleep of IV Sedation for most patients. Antibiotics will most likely be prescribed to combat local infection. Always take prescribed antibiotics exactly as instructed, finishing the set even if you feel normal before it’s finished. To treat pain, take pain medication as needed. Take Tylenol or Advil instead of Acetaminophen. Mix 1 teaspoon of salt with warm water and hold this mixture in your mouth where the infection is. Along with icing of the face, this can help draw the infection towards the surface of the gums so it can drain and help the healing process. Avoid the use of heating pads and smoking until the infection has disappeared. Have a toothache, but can’t see your dentist yet? Check out some home remedies for toothache relief. Dental infections can take many forms and have several causes. When severe, the face can get extremely swollen, and the eyelids can shut. The cause for the infection must be eliminated as well as antibiotics to be used before It can be controlled. It takes a minimum of four days to get an infection under control. This girl was treated a quarter of a century ago. 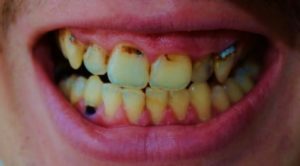 Her mother neglected her permanent first molars and they became infected. I opened up the tooth to allow the puss to drain out. With antibiotics, she was under control in about five days. The man below had a failed root canal from another dental office. His case required me to cut into the abscess to get drainage. Again, this was a case that took about five days on antibiotics to control the infection after the drainage. These patients opted in for IV sedation because the pain was so unbearable, but at least this way, they did not remember any pain from the procedure itself. Our experienced team of dental professionals at Carson & Carson, DDS has over 4 decades of experience in diagnosing and treating serious dental infections. Feel comfortable and pain free being treated at one of the best dental offices that Oxnard has to offer with our professional and courteous dentists Dr. LeRoy Carson & Dr. Derek Carson. Call or make an appointment today with our Oxnard location at (805) 983-0717. 24 hour availability for dental emergencies.